Portal Realms builds off the foundation of GURPS Fantasy, an indispensable guide to all things fantastic! Spice up your fantasy realm with GURPS Magic, an easy-to-understand system that treats magic as skills. With GURPS Thaumatology, you can add strange variant magical options to your new worlds. 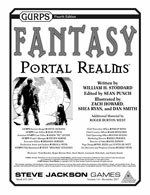 For a huge, ready-to-use example of a type of "portal realm," check out GURPS Banestorm.